Engineering students have launched a website and magazine called, ‘The Hands on Engineer.’ The website www.aes.web4all.co.ke is administered by the students. It is linked to the main University site: www.tukenya.ac.ke and contains topics on media, careers, blogs contacts, alumni among others. A University Council member, Eng. Joseph Nkadayo, presided over the official launch held during the 4th Association of EngineeringStudents (AES-TUK) conference. Eng. Nkadayo said he was impressed by the students’ initiative adding that it will act as a medium of communication and exchange of ideas between the students and the outside world. He explained to the students the importance of understanding the discipline and role of engineers and their impact on the society. He advised them to identify opportunities, think innovatively and help in solving societal problems. “I can see some of you are already working on different projects. Ensure that you innovate something that can address problems we are currently facing as a society,” he said citing examples of heavy traffic jams in urban centres, collapsing buildings, poor drainage systems among others. Eng. Nkadayo emphasised on teamwork and identifying of mentors. He urged students to consult widely and involve stakeholders in their undertakings. 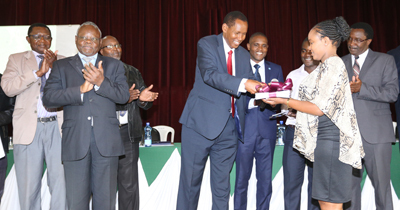 He further added that it was important for students to sharpen their skills in communication, marketing, management and leadership saying this will play a vital role in their careers. “I am delighted that the present engineering students have excellent communication skills unlike our time.To be able to sell your innovations and ideas and explain how an invention is going to help people, you must develop marketing skills,” he emphasised. Eng. Joseph Nkadayo who is also the chairman of Kenya Civil Aviation Authority (KCAA), has a wealth of experience having served the country in different capacities. He has trained engineers for over a decade. Vice-Chancellor Prof. Aduol on his part congratulated the students for organising the conference saying the interaction with the industry gave them exposure and an upper hand in their training. He emphasised on practical training saying that is what is needed by the industry. He explained that it is for this reason that TU-K adopted Industry Based Learning (IBL). “I am impressed that you invited different speakers from the industry to talk to you. The industry needs people with hands on skills. Talk to them and ask questions,” said he. The VC reiterated that the university takes pride of the BTech programme saying it is a unique degree and the first one of its kind in the region. Deputy Vice-Chancellor in charge of Academics, Research and Students Prof. Paul Shiundu thanked Tullow oil and KenGen for sponsoring the event. He added that AES-TUK is not just a vibrant student association,but a recognised professional body that is fully registered. Also present included AES Patron Prof. Alex Muumbo, Director School of Architecture and the Built Environment (SABE) Prof. Sylvester Masu, Ag. Director School of Mechanical and Process Engineering (SMPE) Prof. Bernard Odera, Eng. Stephen Kihanya from Tullow oil, African Young Generation in Nuclear (AYGEN) Secretary General Raphael Chesori, AES Chairman Mourice Ochola among others.